First is a giant CONGRATULATIONS!!! to Bob Casey for brewing up this year’s Marin County Fair 2016 Homebrew Competition Best of Show beer with his Baltic Porter! A complex blend of dark malts, alcohol, chocolate, pilsner and munich all combined for a very successful and delicious brew. It was an incredibly close vote between the top two beers but the complexity of Bob’s brew came out on top. I want to thank everyone that competed and helped out this year one more time. It was a big success that we can build on. Winners are still up on the site on the blog page and listed in the homebrew section of the county fair. The display, albeit a bit small, is the start of a hopefully larger section next year that will be much more informative. I intend to start on that earlier in the year, or even later this year, so everything will just be decided and ready to go by the time the fair hits. The same will be for the organization of the fair. We were just in time this year so next year we will be ahead of the game. A lot of excellent ground work was put down this year in our first club coordinated competition. And then there were 3! The first round of voting for the quarterly style has ended in a 3-way tie. I have whittled down the survey to the remaining 3 options. Please use the survey page and cast your second vote now! I want to give people as early notice as possible for the style as well as allow the presenter time to prep. Voting will close on July 10th, meaning votes after that will not count. I will put the results of the vote on the blog page of the site some time after the 10th and before the 15th. Marinwood Brewfest 2016! This event will take place on Oct. 1st (weather permitting) at the Marinwood CSD Park. Historically ticket prices have been $20 for a tasting glass and 8 tastings. This year, for the first time, they are inviting homebrewers to share their hard work with the beer loving crowd. I personally will try to bring 2 different 5 gallon batches. Due to laws we will have our own section separated from the commercial breweries but we can leave our tables and mingle/taste. The beer would be a donation to the CSD fundraiser, but you will get entry to the event and perhaps a guest ticket if I can work that out too. Email me if you are interested - marinmashers@gmail.com. Also the CSD will be reaching out to other clubs in the area to see if they would be interested. There is a plan to have “favorite” brew voting with some sort of bragging rights trophy (at least in early discussion). It’s a fun event I’ve attended annually from the start and this year it would be nice to talk about my own beer instead of someone else’s. Once there is some sort of weblink I will post it. (READ THIS if nothing else) The July Meeting will be held on Thursday July 21st from 7-9 at Iron Springs brewery in Fairfax. This is the same week as meetings usually are (the one containing the third Wednesday of the month) but it’s a different day. They have bands on Wednesday so we are taking the Thursday spot. A very big thank you goes to Dave Pickford for helping to organize this with the Iron Springs owners and a huge thank you to Iron Springs for hosting us! I’m looking forward to this meeting, it should be great. We can bring samples to share just like every other meeting. The Northern California Homebrew festival is in September but sign-up is this month. More details here http://www.nchfinfo.org/. Please let me know if interested. There is still time to get your brew in to the Sam Adam’s Longshot competition! You give up all rights to the brew for 5K, a trip to GABF and your face on a sixpack sold nationally. And bragging rights of course. "Oh you won homebrewer of the year in your club, good for you. Did you see my face on this sixpack?" Club membership is now at the Q3 discount of $20 for the remainder of the year, the Pay My Dues link is update here and on the MaSH site. 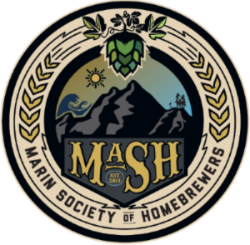 Copyright © 2016 Marin Society of Homebrewers - MaSH, All rights reserved.